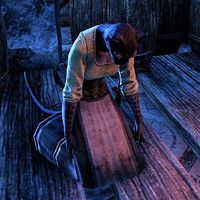 Dorkrivva is a Khajiit soldier in the Mother's Den area of the Shimmerene Waterworks. She walks up and down the stairs to all three levels. At the top landing, all alone, she'll stop, go down to her knees, and bow her head in apparent despair. She has no unique dialogue. This page was last modified on 7 October 2018, at 08:13.